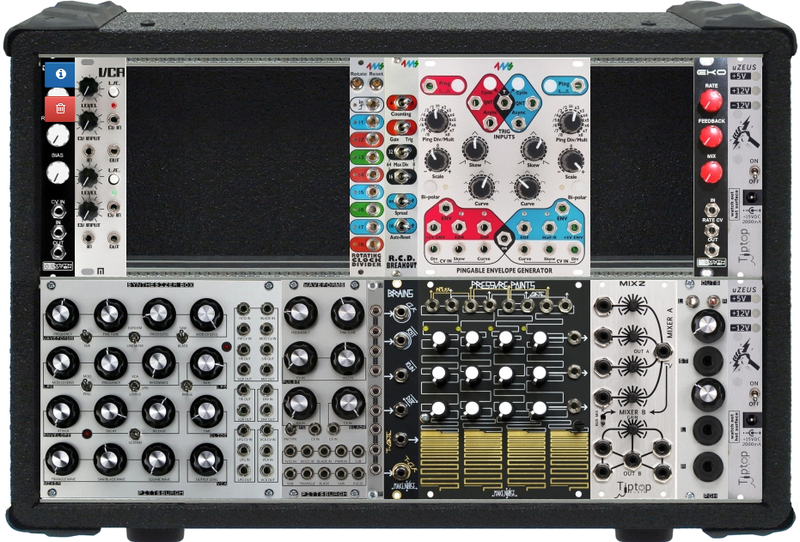 I decided to take the plunge and dive into Modular with a Eurorack setup. I figure that all I do is modify my equipment for control signals and chain them up, why not add in some equipment that is made to do that. The case is a 9U rack case with 2 Tip Top Happy Ending rack ears with 2X uZeus power supplies. The top 3U is just a blank panel. I used velcro secure the Volca Beats and Bass. The sync in/out on the Volcas plays really well with the modular's gating. The Beats has very usable White and Pink noise thanks to my earlier mods. The Bass (not pictured) is currently taken apart for investigation. I am determined to get the CV and gate outs for each of the 3 voices so I can make the Volca Bass a seriously badass sequencer for my modular. I've found a few points and am investing additional circuitry to make it happen. I've found the gate points, but the voltage needs to be bumped up from the 3.3V that the Volcas run off. Details to come. I've already had a lot of chaotic fun with these guys, I have a DSI Curtis Filter on order and a Mutable Instruments Braids on the way. Eventually, I want a Make Noise Wogglebug and René. We'll see about that. I really like getting this guys going with the Arturia Minibrute and Korg MS-20 Mini. There is a lot of fun to be had with all 3. I use my Minibrute as a MIDI>CV converter too, along with being a great arpeggiator. There is much more to come! Including new Eurorack module designs.